Serengeti National Park was created in 1951. It is located in Northern Tanzania, covering a vast area of 14, 763 sq. km. The lanscape here consists of rolling plains. Relief features of the area gave the name of this place. 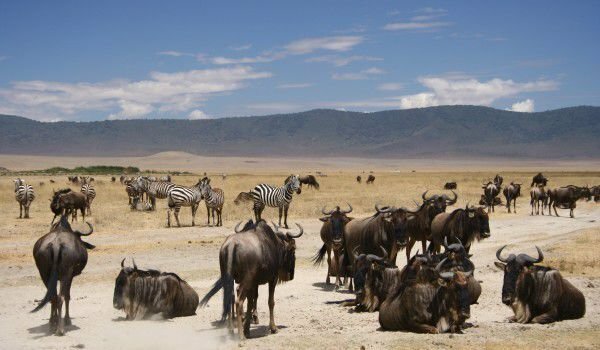 In the language of the local population Serengeti means exactly "endless plains". The above sea level height of this plateau is between 914 and 1829 meters. Safari in the reserve will allow you to watch the annual migration of wild beasts and zebras. If you come here, you should hire an air balloon with which to explore and enjoy the wondrous scenery. Very close to the park is located the ravine Olduvai Gorge, where they found many of the most ancient remains and artifacts related to human prehistory. In this so-called cradle of the human species, in 1959 anthropologists Louis and Mary Leakey discovered the two million years old remains, which connect man with the apes. Serengeti National Park is an UNESCO World Heritage site. The park is located in the Seronera area where Professor Bernhard and Michael Gzhimek studied black rhinos. In this intact Savannah live more than 35 species of mammals. Most atractive here are lions. Lion chase r watchful antelopes in the daytime, that are able to run much faster than them. After nightfall, one after the other, the lionesses silently sink into darkness and surround the herd. Scary screams of frightened animals tell men where they can expect lionesses. When catches of zebras and antelopes are sufficient, lions feed almost exclusively with them. Predators usually eat two or three times during the day, but are able to withstand without food for several weeks. Other inhabitants of the Serengeti are zebras, antelopes, rhinos, hyenas, elephants and bison. In addition, here live more than 500 different species of birds, some of which are not found anywhere else in the world. Perhaps the biggest attraction for tourists here is the period when the animals migrate 800 km for the May dry period. Nearly 2 million mammals move over that time, only to return again in December. Rare and mostly low vegetation does help those who want to monitor the flow of animals extremely easily.